Hamilton shaves another three tenths off his time, extending his lead over Rosberg to nearly nine tenths. Ali, Jordan, Tiger...even Colin Montgomerie was arrogant and he sucked. @mfbull: There are some chaps on our UK desk here who might not agree with that. Rosberg goes fastest with a blistering lap of his own, a full half second faster than Hamilton now. He went purple in S1 and S2. Vettel, the man dominating so much of our conversations here, the only man yet to record a lap. Raikkonen also really struggling, he's just ahead of the Lotus' in 15th. Alonso, meanwhile, is fourth. Has anyone heard about a return to F1 of major Japanese sponsorship, in addition to Honda? When I was in Tokyo last week I heard this in several places, where people would usually know about such things. Anyone have any ideas? Hey Nate, do u have some info about McLaren updates for this race? Their pace looks so good. @Kristiyan: Teams don't tend to reveal their upgrades, for obvious reasons. I've noticed a few tweaks to their nose and something at the back of the car, too. Clear that McLaren has really made progress over a few races, not just today. Yeah, really, 4 championships and now is about to slide into a seat at a 'new' Ferrari. I would say his career is going swimmingly. Hamilton returns to the pit lane having aborted another lap of his own. Looks like the championship leader lost the rear under braking in Turn 12, but he managed to catch the slide pretty well. And Vettel's supporters seem incapable of recognising any part of his character that some might see as negative even when it is a normal part of the character of a successful sportsman. It makes them very easy to wind up. @Phil,Maidenhead: I do feel that most 'Vettel haters' are in reality 'Vettel trolls' for this very reason. Why SFI look so slow? @Race_Soul: Early stages of this session yet - remember we don't know fuel loads or what run plans these drivers are on. Hulkenberg finished ninth in the morning session, even if Perez was 15th. @Billy: Tough to see more major Japanese sponsorship without a driver in the game. Kobayashi brought little. No big names want to be on a backmarker. Blind support for anyone invites such a response. How're SFI's finances? Is their championship position keeping the cash flow taps on? @mfbull: Force India are one of the other teams who you would say are on the slippery slope. Not unable to race just yet but in a position where finances are tight. We're approaching the end of the first half hour and we still haven't seen any driver bolt on a set of soft tyres. 'Merica is the land of the 'Naughty Costume'...did we get that from your British birds? Enjoying talent is different than liking a person. I seem to remember Phil Hill not being very likable. Don't worry, if you're just glancing at that image below - Hamilton's tyres aren't on fire. That is a nifty little thermal image from FOM. 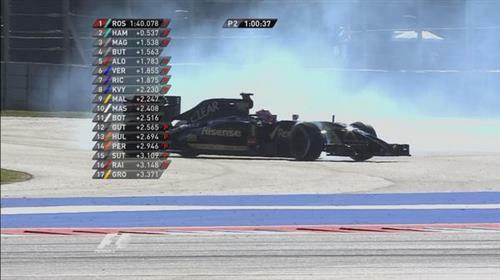 Grosjean spins through the Esses and comes to a stop on the tarmac. Looks like he just turned in too much and clouted the second apex. "Are you sure things are working properly?" Grosjean asks. 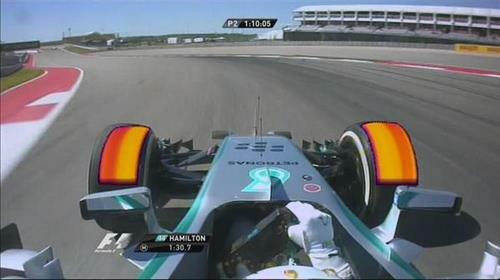 It looks like Hamilton has the German flag on his tires. Is that it? @ALessandro17: Force India certainly has one of the best driver line-ups of the current grid. Not a lot of teams who would pass up the chance to sign Hulkenberg in an ideal scenario, I'd wager. There's been a definite improvement in F1's social media useage this year. It's still pretty lacking compared to other sport's, but it's a start. Damn clever these Merc engineers, getting the German flag on Hamilton's tyres. The orange on that McLaren looks lovely. Next year already weighing heavily on their wallet. 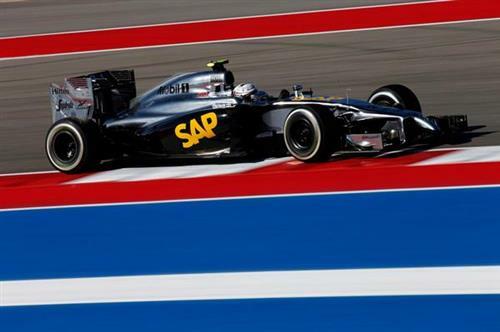 Is that a new sponsor on the McLaren? @farrugiamaths: McLaren has been offering up its sidepod sponsorship space to different sponsors this year, as its hunt for a title sponsor continues.